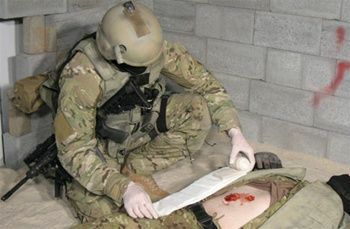 The Tactical Medical Solutions Blast Bandage was designed to provide the ability to quickly package traumatic amputations, burns and large pattern wounds with minimal effort and minimal use of supplies. The Blast Bandage covers a 20" X 20" treatment area, but packs down to about the size of a 4" combat bandage. The Blast Bandage features a large non-adherent wound pad that can be easily wrapped around limbs and secured with the attached elastic wrap. It provides a large sterile protective covering for shrapnel wounds or burns. With such a large coverage area, the Blast Bandage is large enough to cover the entire back or chest of most patients. It also offers a removable occlusive layer that will cover a 19" x 19" area, or can be used to cover abdominal contents minimizing the loss of heat and moisture. As with Tac Med Solutions' other bandages, the brakes on the bandage help prevent accidental unrolling of the elastic wrap during high stress application. These brakes are especially helpful while dressing amputations. Multiple points of adhesion prevent slippage of the elastic during the wrapping process. This creates a more secure, effective bandage and decreases the chance of the wound being exposed during movement. Had a neighbor sever a hand in his shop. This thing would have been just the ticket to get him ready to transport! Covering a wound like that isn't easy with other options. Everyone should have one of these in their shop. You've stopped the bleeding, now what? Not too many products that address the ends of a severed limb, and keep it neater and cleaner during transport. When combined with a way to cover a larger affected area of trauma, like a torso, this product can't be beat. It would be nice if it packed a little flatter. Works just like the OLAES but has another dressing inside. Does what it should. I have never used the Blast Bandage. However, I have used the 6" Oleas when I was in Rocky Point Mexico. The 6" has the same features as the Blast minus the expandable abdominal pad. I used it to splint, wrap and bandage a knee injury. I love that the Oleas are basically 5 bandages in one (removable gauze, occulsive dressing, pressure bar, trauma pad & ace wrap). An excellent product!!!! So many differenct applications with one dressing. Take the place of several supplies.